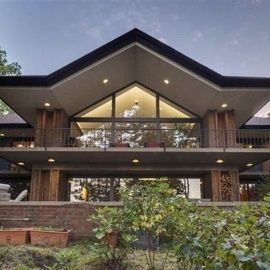 This iconic Gatlinburg home was designed by famed architect Hubert Bebb, and has been completely restored with careful attention to every detail, adding modern finishes and upgrades while maintaining the integrity of the design. This Gatlinburg home is an entertainers dream, with generous spaces both inside and out that just flow from one to the next. 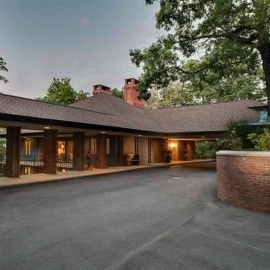 The main home features 6 bedrooms, 6 full baths, and 3 half baths. Walk down a covered breezeway to the guest quarters offering a private King bedroom, living room, two full bathrooms, and kitchenette. Adults and children alike will love playing endless rounds of basketball, air hockey, and MsPacMan in your own Gatlinburg home away from home. All just seconds from the Arts and Crafts community, the Great Smoky Mountains National Park, downtown Gatlinburg, and Dollywood. Add to that an expansive parking lot and a massive gourmet kitchen and you have The Breezeway, the ideal cabin for your family gathering.